The day you get married is, if not the happiest day of your life, somewhere near the top of the list. One respect in which it’ll probably be the undisputed champion is expense – getting married, and throwing a party to go alongside the ceremony itself, is a seriously costly business. And a sizeable chunk of this expense is typically constituted by food. After all, when you’re inviting hundreds of people to congregate in one place for a celebration that spans for hours, then you’ll need to get them fed if you want to prevent them from being miserable. Striking the right balance between cost and quality is tricky – but there are other pitfalls that’ll make your menu needlessly stressful or otherwise unfit for purpose. Let’s take a look at some of them, and how they might be avoided. If you’re especially fond of a certain sort of food, then you might be tempted to construct your menu so that all of your favourites are there. This is a mistake, since you’re not going to be the only person eating. If you’re fond of meat, for example, then you might be tempted to opt for a wholly carnivorous meal. But if you’re inviting hundreds of people to eat with you, then the chances are overwhelming that at least one of them will be a vegetarian – and probably more than that. Some might even be vegan. It’s also worth considering that some of your guests will have allergies to certain foodstuffs. It’s worth avoiding stuff like peanuts altogether, since cross-contamination between the different items on the menu will always be a risk. 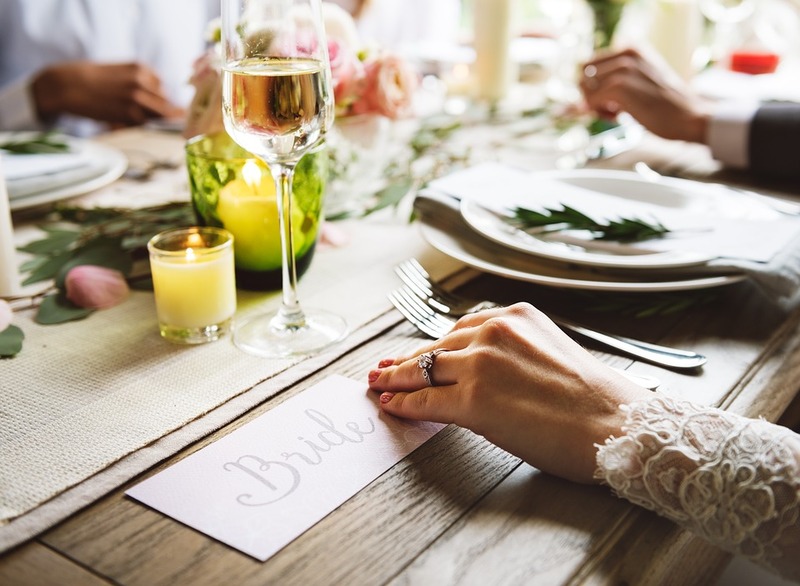 Having one of your guests suffer an anaphylactic shock and collapse in the middle of the dining area is likely to put something of a downer on the wedding – and be embarrassing, even if it isn’t life-endangering. If you’re going to be serving hundreds of people within a short space of time, then it’s important that you don’t overcomplicate. While it might seem like a good opportunity to impress your guests with something incredibly fiddly and fancy, they’re likely to be a great deal less impressed if they have to wait for ages to enjoy it. If you have fifty people waiting for something that takes twenty seconds to prepare, it follows that the last person in line will be waiting for more than a quarter of an hour. Small wonder, then, that sausage rolls and pineapple-and-cheese-on-a-stick are such staples of the wedding buffet. Some of the most delicious foods in the world are served raw. Sushi and steak tartare are prime examples of how to approach this variety of food right. You might even enjoy a raw diet constantly for health reasons – and be keen to spread the good word to your friends and family through your menu. This isn’t such a good idea for two main reasons. The first is that your guests might not be as adventurous as you, and not like the idea of raw food in the first place. The second is that there’s always a remote chance you’ll poison them. If you’re determined to serve raw food, be sure that you’ve solicited a caterer with a good reputation. With all of the cautionary notes we’ve just sounded, it might be tempting to play it safe. After all, everyone knows that a prawn cocktail is a staple at a wedding. But at the same time, you don’t want to bore your guests stupid. Even a slight twist on the classics will be enough to get your guests talking. Like a good science-fiction writer, you want to lure people in with a balance of the strange and the familiar – the former to keep them entertained, and the latter to keep them grounded. If you hear someone enthusiastically ask someone else whether they’ve tried the sausage rolls, then you’ll know you’re onto a winning balance. Whether you’re hosting your wedding in the middle of one of the many London river cruises operating every day, some other more grounded London wedding reception venue, or even somewhere else in some other area of the country, you’ll need to worry about food. But provided that you strike the appropriate balance between the safe and the exotic, you’ll be able to put together a menu that pleases the maximum possible number of people. Follow these basic guidelines, and you’ll provide your guests with food they’ll love.